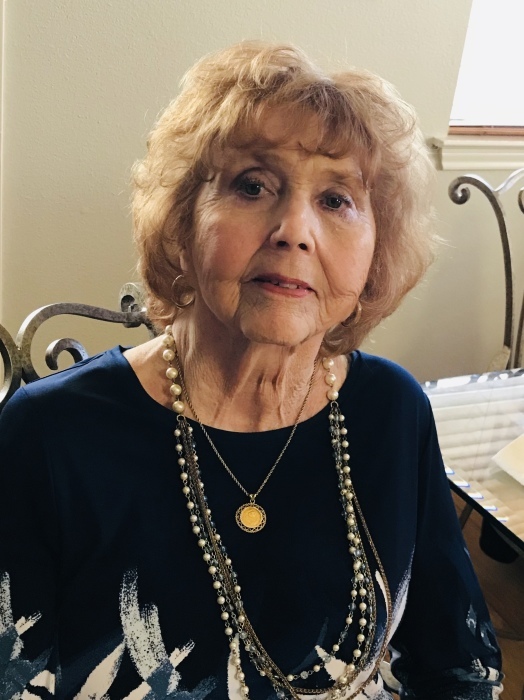 Beverly Ann Anderson, 81, passed away on February 10, 2019 and joined her beloved husband in heaven just 14 months after his journey on earth ended. Beverly was born in Socorro, Texas on April 15, 1937 to Joseph DeFriez Jarvis and Minnie Susie Lawrence, the youngest of their 7 children. She was always known for her beautiful, fiery red hair and the personality that matched it. Beverly grew up in El Paso, Texas and spent time with extended family in Colonia Juarez, Mexico in the summers. Being the youngest of 7 children, Beverly had a close relationship growing up with a number of her nieces and nephews, a few of those nieces she counted like sisters. All of her school years were spent in El Paso and Beverly graduated from Austin High School, the same school her son and daughter would later graduate from. Not long after graduating from high school, Beverly met a handsome man named Ray Anderson who would soon become her husband. He spotted her at church one Sunday and that week, Ray and a friend tracked her down. Ray and Beverly officially met on her front porch and the rest was history. They were married in Las Cruces, NM on May 4, 1956. Their 61-year marriage gave them 2 wonderful children, Donald and Linda. As members of The Church of Jesus Christ of Latter-Day Saints, they sealed their marriage for time and all eternity in the Manti Temple on their 43rd wedding anniversary, May 4, 1999. During their time in El Paso raising children, Ray was busy with his work for the U.S. Army Missile Command at Fort Bliss and Beverly was never without things to do. She was a realtor and later a broker in El Paso and very active in the real estate community. Beverly also raised collie dogs and was never without a dog, even though in later years, they all seemed to choose Ray over her. After their children were grown, Ray and Bev were able to live in Germany for his career on three separate occasions. Beverly was very active with the wives’ clubs on base and was a tour director and arranged trips throughout Europe for those stationed overseas. Her love of travel never ended. In 1991, Ray and Beverly moved from El Paso to the Texas Hill Country and bought a mobile home park in Center Point, Texas to work at as their retirement. Beverly wanted to be closer to her 3 granddaughters and since she and Ray could never sit still, retirement for them was more of a career change. They worked hard and made the park a huge success, with Beverly as the manager, all while having lots of fun. During that time, they also purchased a rental condo on the Alabama coast and spent many summer, Easter, and winter vacations there with their daughter and granddaughters. Because both Ray and Bev loved to travel and were not afraid of a good road trip, they loved their fifth wheel trailer and later their RV. They would take long trips and visit extended family all over the country, always with a little white dog in tow. 2006 brought real retirement when Beverly and Ray moved into their dream home in Leeds, Utah. While living in Leeds, more of their adventurous sides came out. Beverly loved to get out on her off road vehicle with Ray and their friends and go for miles. Their time in Leeds was full of catching up with old friends and enjoying being outside and spending all their days together. After 10 years in Leeds, Beverly and Ray moved back to Texas to be close to their ever-expanding family and to have the help of their daughter as Ray’s Parkinson’s progressed. Beverly had more talent, smarts, and heart than most people. She was a gifted artist. Her oil paintings of places she visited and scenes she loved were so detailed and beautiful and will always be cherished by her family. Beverly go do anything. She would go from tiling a bathroom, to sewing curtains for a dollhouse she was building, to gutting a deer her husband brought home, and then wash up and make a wonderful from scratch dinner. She was constantly in service to those around her. She served as the President of the Relief Society, her church’s women’s organization and the President of the Young Women’s organization at church as well. Our Nana was easy to talk to, easy to love, and will never be forgotten for all that she taught us through the life she lived. Her love story with her dear husband, Ray, is one for the ages. They went back and forth constantly serving each other through ups and downs. They were a perfect balance, a perfect pair, and now they are reunited and for that we all rejoice. Beverly was preceded in death by her loving husband of 61 years, Ray DeMill Anderson. She is survived by son, Donald Anderson and wife, Kathy; daughter Linda Voyles and husband, LB; granddaughters, Amber Stevenson and husband, Zachary, along with their 3 boys, Ashley Williamson and husband, Jeremy, along with their 4 children, and April Dickson and husband, Joey, along with their 3 children. Beverly was also preceded in death by her parents, Joseph Jarvis and Minnie Lawrence; and her 7 older siblings, Josephine, Jean, Joseph, Flora, Lillian, and Betty. A memorial service will be held Saturday, March 2 at 11:00 a.m. at The Church of Jesus Christ of Latter Day Saints, 90 S. Main Street, Manti, Utah and will be followed by a graveside service.